Have you ever had the feeling you are being watched? Well if you are a fisherman and are intending to do some fishing along the golden beaches of Plettenberg Bay being watched is a reality. In these days of fishing quotas, bag limits and even the amount of bait you are allowed to take per day one knows that you will surely at some time or another be approached by a fisheries inspector to inspect your catch. It is however not these legal people that I am discussing here but the self appointed policemen and women that patrol the beaches of Plettenberg Bay. 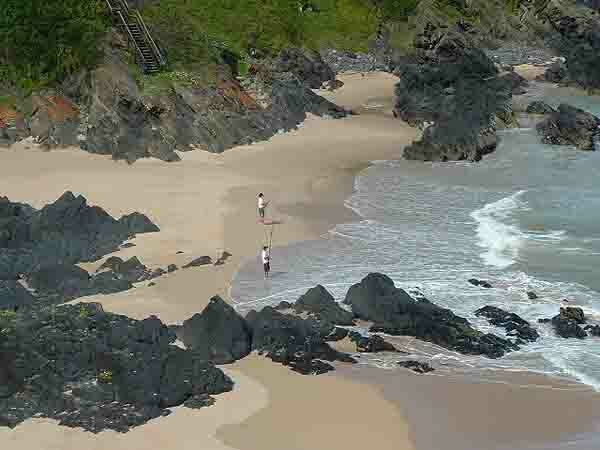 Walking onto the beach with a fishing rod in your hand you are immediately spotted by one of them and your every movement will be followed until such time as you leave. Not only will you be watched but the moment you move from your fishing equipment an inspection will be undertaken. These guys are very well equipped, they can do air reconnaiscance, or they can sneak up and do a ground inspection as well. Whatever you do, do not be untidy and leave your bait lying around. These beach policemen will confiscate it without question no matter what time of day it is. I have seen them confiscate the bait of a fisherman 5 minutes after his arrival on the beach which means that the fisherman has to pack up and go home as his day of fishing has been spoilt. There also seems to be no shortage of reinforcements as a single cry brings them in by air in seconds. On enquiry at the local police offices you will find that this police force is not authorised by any government department nor do they even know of their existence. Yet! fishermen are left to the mercy of these beach policeman. These guys have their good side as well. They don't mind if you catch more than your quota, have more bait than you are allowed or even catch fish out of season. Your only crime as far as they are concerned is being careless with your bait. I suppose you have guessed by now who these self appointed officials are. 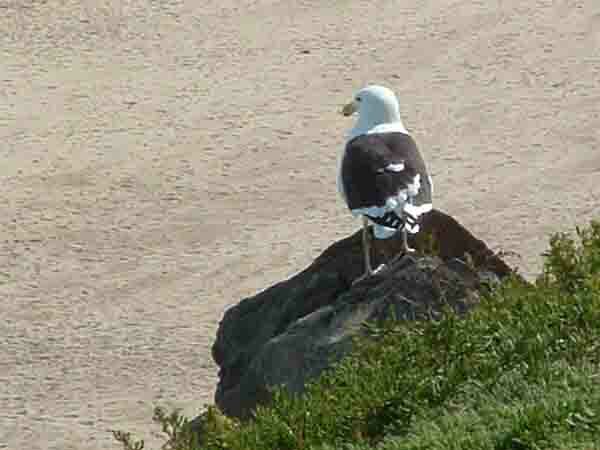 Yes they are the local sea gulls that patrol the beaches of Plettenberg Bay. After watching their antics for a couple of days and having fallen foul to their confiscation methods on one occasion I am always careful with my bait when fishing along these beautiful beaches. Next time you visit one of the beaches note how the gulls spread out along the beach. You are sure to see at least one of them sitting watching you every 100 metres or so. 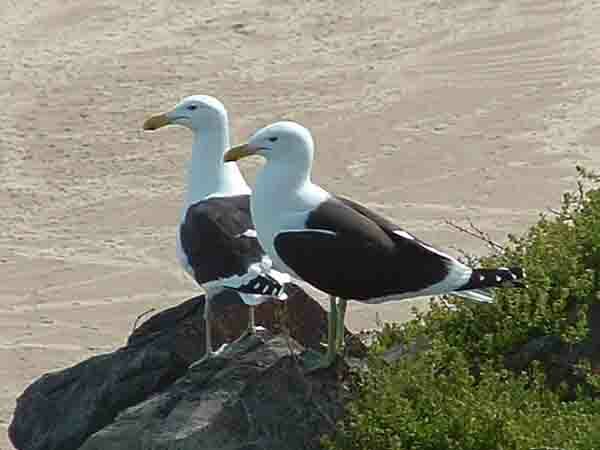 Sometimes they pair off and two will sit together watching opposite sides of the beach. In Plettenberg Bay other than the golden beaches there are also a number of rocky outcrops where fishermen go to fish. Just look up at the outcrops and you are sure to find a number of these birds either gliding along the edge of them or sitting eyeing your every movement. It's no wonder that the beaches are so clean, not a piece of fish or bait anywhere. While visiting Plettenberg Bay recently I sat watching a fisherman dispose of his unwanted bait by throwing it into the surf where the waves were about two feet high. The gulls were there in a flash and when they spotted a fish floating in the waves they immediately dived for it. It was amazing how they dived into the curl of a breaking wave and once the wave had passed over them surfaced with the fish in their beaks. I would have imagined that the waves would have broken a wing or something as they dived in with their wings open but this was not the case. The unwanted bait was soon disposed of and the birds made their way back to their vantage points along the beaches. A word of warning, when fishing along these beaches DO NOT leave your bait lying about, it WILL be gone in a flash and your day's fishing will be spoilt. Next time you spend some time on the beaches of Plettenberg Bay take someone with you to watch your back and protect your bait.